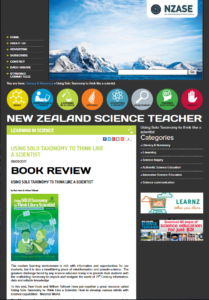 The New Zealand Science Teacher has just published a fabulous review of Using SOLO Taxonomy to Think Like a Scientist: How to develop curious minds with the science capabilities. The modern learning environment is rich with information and opportunities for our students, but it is also a bewildering place of misinformation and pseudo-science. The greatest challenge faced by any science educator today is to provide their students with the scaffolding necessary to unpack and navigate the world of 21st Century information, data and reliable knowledge. To this end, Pam Hook and Willem Tolhoek have put together a great resource called Using Solo Taxonomy to Think Like a Scientist: How to develop curious minds with science capabilites – Material World. Reference: Hook, P., and Tolhoek, W. (2017). Using SOLO Taxonomy to Think Like a Scientist. How to develop curious minds with the science capabilities. The Material World. Essential Resources Educational Publishers Limited. New Zealand.